According to tweets from the past 36 hours, a few lucky people spotted Michael Fassbender in London. So his four month business and pleasure stay down under is over. I'm sure Michael enjoyed the past month in Australia, especially when his parents came down to spend the holidays with him. Now, it's back to work, work, work, and this year is building up to be possibly the biggest year in Michael's career. He will start filming the Steve Jobs movie in a matter of weeks, and then immediately after that, he'll start on X-Men. In between the filming of these two movies, Michael may have to do some promotion for Slow West and Trespass Against Us, and I think MacBeth is being primed to bow at Cannes in May. If you remember, a sneak peek of MacBeth was shown at Cannes last year. With the 'Steve Jobs' movie being filmed so early in 2015 (similar to the filming and completion schedule of 12 Years a Slave), 'Jobs' will likely be completed to be released in December 2015. There's no way this film is going to wait to be released in 2016, not with it having such strong Oscar cred associated with it. And speaking of 2016, we finally received legitimate updates this week on 'Assassin's Creed'. It will be released on December 21, 2016. 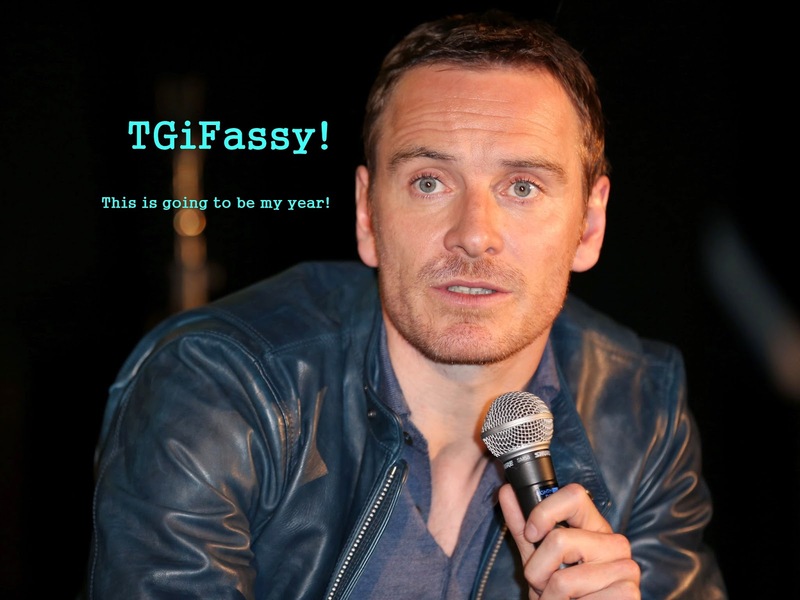 So with that, there's no way two Fassy films are going to come out in the same month that year. Michael should start filming 'Creed' very early in 2016. As Michael prepares to travel to the US soon to film the Jobs movie, I look forward to seeing pics of him with dark and feathered 80s and 90s hair styles. This film is going to be an event! Woo Hoo! A great year for Michael means plenty of photo opps for us! Yay! Hey Martha, I'm glad the new Captcha thingy is working good for you. I don't have control over it and it was causing me problems too. I think the difficulty of it has affected people's ability to comment so I'm glad it's easier. I think, they will also start filming Assassin's Creed this year to be able to release it Dec. 2016. Being an action fantasy, it's post-production phase will take almost a year. But, he will be filming Prometheus 2 ahead of Assassin's Creed. With Steve Jobs & X-Men already on the line, indeed, 2015 will, so far, be the busiest year for Michael. I agree Hodgepodge 2015 will be extremely busy for Michael. So the Jobs filming is probably starting this coming week. As soon as that is done he goes to Canada for X-Men. Does anyone know if Prometheus 2 will be filmed in Iceland again? Thoughts on where Assasins will film. Besides Jobs all the others I think are going to be physically demanding on him. But he's still pretty young. And then he also has to fit in his appearances for his films! Yikes hope he doesn't suffer from exhaustion. I don't know where Prometheus will be filmed. For cinematography consistency, Iceland would be ideal, but they could do it all at Pinewood in England. For 'Creed', since Ubisoft is helping with the film, they are based in France. So I think AC will be filmed somewhere in Europe, with a lot of work being CGI, green screen production, it will take a lot of post-prod work before it's released.